Image: Not Luna, but another in the same family of Soviet launch vehicles. and the first circumlunar probe to return to Earth. The two successful series of Soviet probes were the Luna (24 lunar missions) and the Zond (5 lunar missions). Luna 1 was the first spacecraft to reach the Moon; Luna 2 was the first spacecraft to "land" on the Moon (impacting the lunar surface east of Mare Serenitatis); and Luna 3 was the first to return images of the lunar far side. 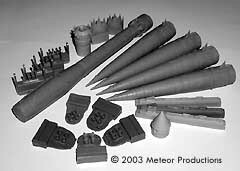 Cutting Edge's 1/144 kit of the R7 booster with Luna 1,2,3 payloads depicts the vehicles used for the first three missions, all flown in 1959. Mastered by NASA pattern-maker patternmaker Ben Guenther (with additional work by Scott Battistoni) it is based on the plans in Peter Alway's "Rockets of the World." Cutting Edge says the kit "avoids the accuracy problems with the Airfix and AER kits" - I'm not very familiarwith the Airfix kits, so I can't address those issues. Here is what you get when you buy the Cutting Edge kit, though. 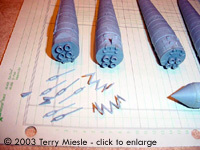 One main booster section and four secondary booster sections each with corresponding engine nozzles. 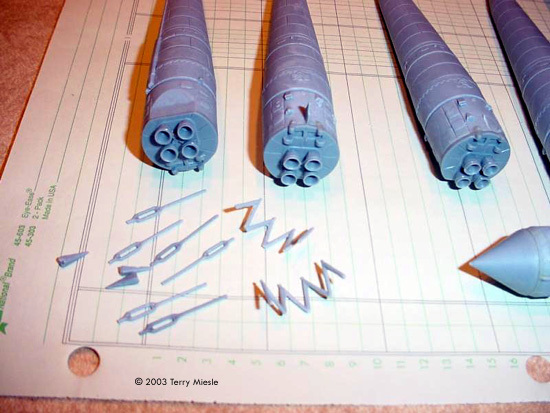 A set of small directional nozzles which will be glued in place later. A payload section of a cone and sub-booster. This will be atttached with a set of braces. Also included are "straps" for the main booster and a nozzle. Cutting Edge was thoughtful enough to include one spare set of these last pieces, as potential for damaging these straps is quite high. At 1/144 scale, this kit stands about 8½ inches (22cm) tall. Cutting Edge uses a strong grey resin which is quite resistant to breaking and very easy to work with. They have a great reputation for well-cast products. However, I found bits of mold rubber in a couple places on my kit, and a glob of resin on the main booster, apparantly from mold breakage. I have no doubt the molds would soon be replaced. Closer inspection revealed that the four "strap-on" boosters in my particilar kit were not the same size - two were noticibly shorter (almost 2mm), and don't quite reach the mounting points on the central booster body.. I'm not sure if that's the way it's supposed or be or not, but other modelers with examples of this kit report having 4 identical boosters, so I'm guessing someone goofed when packing. Removing the pourstubs from the boosters will be tricky, the instructions do mention the need for care not to damage the secondary booster fins. I wasn't careful enough, and tore two of these fins off. The instructions are probably the weakest part of this kit. It's a series of notes rather than a specific set of instructions, but a set of pictures do go a long way toward making up for this deficiency. No color references are provided. There is a great deal of ambiguity regarding the colors, and I'm still researching these. 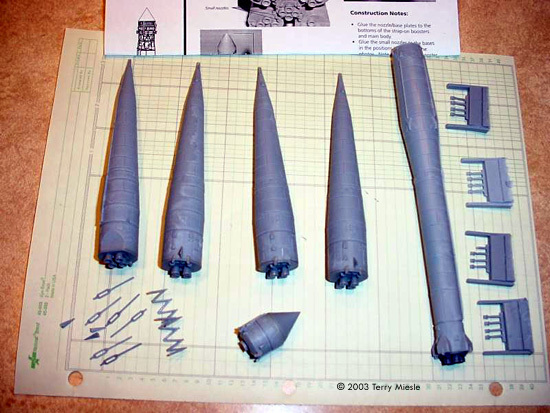 Apparently the Luna rockets were all gray, the ever-attractive battleship grey or something slightly lighter. The Vostok had some white on the payload section, and other vehicles apparantly were all white. No decals were provided, so you're on your own to determine if any markings would have been visible. I'm impressed (as usual) with Cutting Edge's casting, and this looks to be an easy assembly. It's not cheap, but I think $50 is a fair price considering the fine casting and the fine details of the small parts. Many thanks to Terry's wallet for providing the review sample. Manufacturers and retailers, interested in getting your wares reviewed and publicized on a site averaging 3500+ readers a day? Contact us! This page copyright © 2003 Starship Modeler. First posted on 11 September 2003.